I love books on drinks, not only because most of them are very readable, but because many are now fantastically well illustrated. 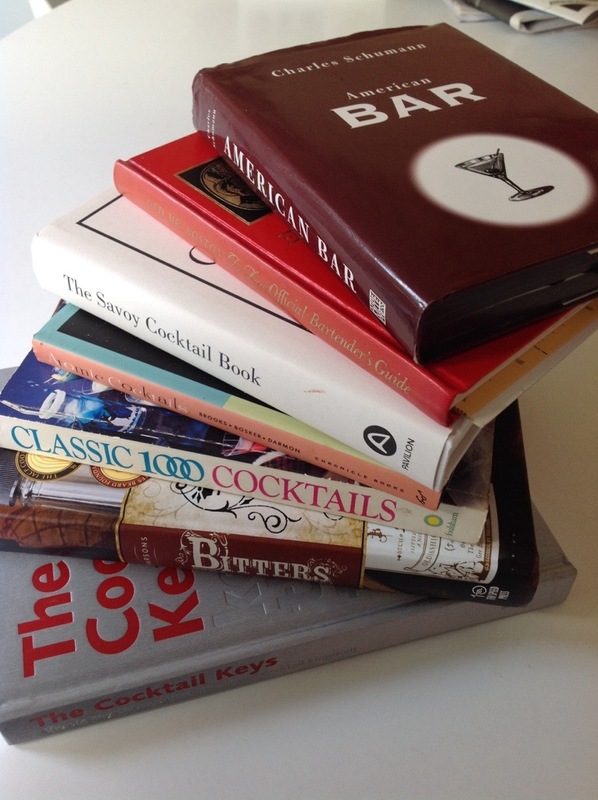 Like recipe books, of which I have a fair few as well, drink books understand that the design & presentation is equal to the importance of the words, and so most now are visually impressive, cleverly laid out and beautifully printed. My library now includes the following books, all of which I recommend. If you would like further details, click on the link text, which will take you to my Amazon associates page for each book. Any of these would make a fine start to a cocktail collection, but if I had to choose just one, then Schuman’s American Bar would win the spot; it is a brilliant guide to how we drink, why we drink & what we drink. It was the first book on drinks I ever owned, and I refer, and defer, to it still. Evenings with friends now include mixed drinks before eating, and I like to try new recipes and methods with them, as well as classic recipes. As I find I am transporting more equipment each time, I needed a dedicated method of making sure I had everything with me in an easily portable format. Bartender bags & cases are not a new invention, and top mixologist Jim Meehan has designed perhaps the ultimate utility bag, supplied by top-end leatherworkers, Moore & Giles. However, at around $1,000, this beautiful object is a little too expensive for my current needs. My solution was a £25 camera case from the UK electronics supplier, Maplin. The case is designed for carrying delicate photo or electronic equipment, and has a foam insert that is pre-cut in a grid format to allow one to arrange the storage to suit. Let alone allowing for Amazon’s extensive lists, a visit to a local bookshop will usually reveal half a dozen books on drink mixing on the shelves. There is one I return to, time after time, as the design and the size of it is just perfect to keep close to hand – Schumann’s American Bar. Shaker. It is possible mix a cocktail in a jar or a jug, but since presentation is part of the pleasure, everyone should own at least one decent shaker. You’ll find plenty of opinion divided on the Cobbler versus the Boston shaker. The difference? The Cobbler is the classic three-part shaker with the body, strainer and cap. Bar aficionados dislike the built-in strainer as it clogs with ice too easily, but a classic stainless steel Cobbler looks good in your cocktail kit. The Boston is the glass and steel two-part combination that professional bar people seem to prefer, especially in the US – probably because the customer can see the drink being mixed as they shake, and the parts (glass jar and metal cup) are more interchangeable; you can also use the glass part for stirred drinks, without it chilling in the hands as much as the base of the Cobbler. Occasionally, one also comes across a third type – the French or Parisian shaker – which is pretty much just a Cobbler without the strainer top. It is apparently gaining popularity in the US. Stirring glass. If, unlike Bond, you prefer not to shake your cocktails, then the best place to make one is a large stirring glass, typically with a 500-700ml capacity. A decent stirring glass usually has a spout, to allow for tidy pouring after mixing, for which you’ll need a long-handled bar spoon (see below). The stirring glass is the best option for some of the classic drinks, such as the Old Fashioned & the Manhattan. Measure. Accurate measure are important if you want to mix drinks consistently. A good barperson can pour by counting, using a pouring top, but for the rest of us, a drink measure is invaluable. The simplest is the double-ended type: the larger cup holds around 50ml (a jigger) and the smaller, 25ml (a pony). The problem with these is that as you flip them over to use the ends, you get drips of the previous measure everywhere – better to buy a pair of small measures, if you can. The most elegant double measures are the Japanese style – the two cups are elegantly slanted, and meet together at their narrow base. They often have rolled rim that prevents drips. Bar Spoon. Simply, a long spoon for stirring drinks, typically in the Stirring glass (see above). Real bar spoons have a spiral handle that allows you to rotate them between the fingers, as a stirred drink should be treated gently. Any long-handled spoon will do, but I would avoid the cheaper spoons that have a spike under a rubber cap. I assume these are to get olives or cherries out of jars, but the cap seems to disappear all too readily. Otherwise they come with a flat plate on the end, presumably to be used as a muddler; really, they are too lightweight to be used for this. There’s a special knack to using the spoon smoothly – trying sitting the handle between your first & second, third finger and then fourth finger alternately, so the spoon stands vertically, bowl downwards, and then stir with an elegant rotation of the wrist. This is a lot easier to do, than describe – look at images of bar staff online & you’ll soon spot it. Strainer. To use a Boston or French shaker, a strainer is essential. The Hawthorn type is the bar standard – a pierced plate with a number of prongs that allows is to be rested flat on the rim of the shaker, and held down with the fingers while pouring. A spiral spring around the edge of the plate filters out the coarser lumps of ice or fruit, but allows some small pieces through. If you see a drink recipe that requires double-straining, then correctly you’ll need a small mesh strainer to use at the same time – the hawthorn catches the big lumps of ice, while the small strainer, held in the other hand below separates out the final tiny shards and leaves the drink pristine. 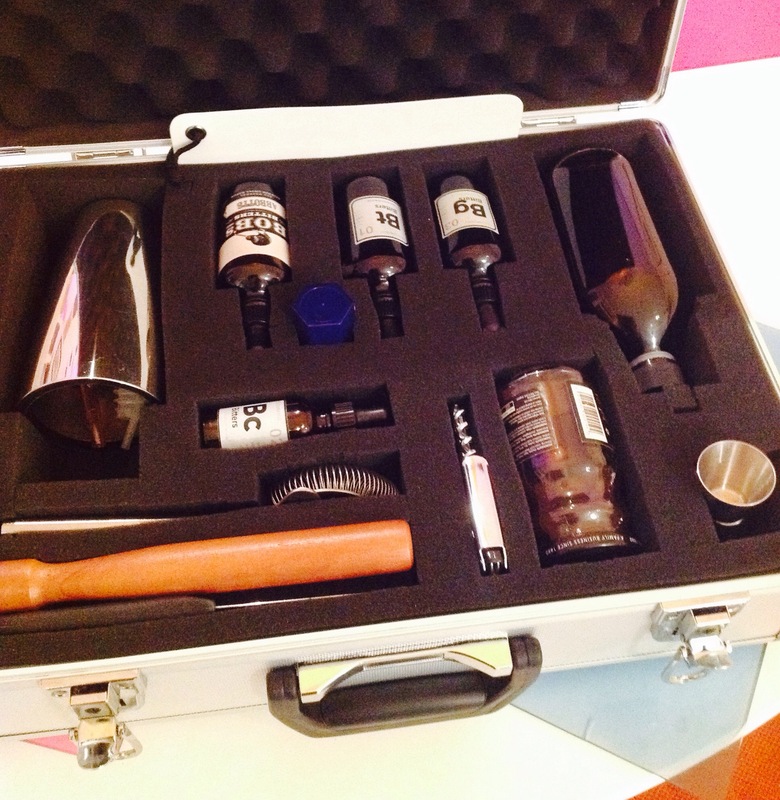 It’s a bit fussy, but worth it for a really neat Martini or Manhattan presentation. Muddler. To get the flavours out of some ingredients, like citrus zest in the Old Fashioned, they need to be crushed to release their oils and juices in the glass. A heavy spoon would do this, but the best tool is a muddler, which is simply a short length of a thick wooden dowel, somewhat like a miniature baseball bat. Available in various lengths, one around the 8″ (or 200mm) mark seems to be the most useful. Modern metal versions are available with a rubber end, which might suit your bar’s aesthetic better. If using the wooden ones, try to avoid the varnished type – in my experience, this just chips off after a while, presumably ending up in your drink. Paring knife. Garnishes are a big part of a drink’s presentation, and cocktails like the Old-fashioned really benefit from a large slice of orange peel being spritzed over their surface. To prepare slices like this, you need a good, sharp knife – either with a straight or curved blade. The brand I prefer most for this is Opinel: the blades are just the right length, and sharpen beautifully. Ice bucket. A double-walled bucket is pretty handy for keeping ice fresh and frozen while you are mixing; otherwise, you’ll be making frequent trips to the freezer to replenish a regular bowl, as ice seems to disappear very quickly once it is sitting in its own meltwater. Ice. I found a second-hand ice machine on eBay a few years back, which has proved valuable for stocking ice buckets for chilling wine etc., but I don’t use it for cocktail ice. For this, I buy the ready-bagged big ice cubes from the supermarket: it’s cheap, and far, far better quality in terms of clarity and size than I can make easily at home. Five bags easily get me through a cocktail party, and costs me only a few pounds. Don’t ruin a cocktail by using a few cubes from the plastic ice tray in the back of the freezer; use fresh ice and use lots of it.